As Uganda’s population increases, many young people are having trouble finding jobs that pay well. A government directive to introduce the teaching of Mandarin Chinese in schools may lead to better employment opportunities. China is a major trade partner and investor in Africa, and many countries are encouraging their citizens to learn what is considered by many to be the language of the future. Last year, Uganda’s Ministry of Education named 35 schools countrywide where the Chinese language would be taught. Students learn Mandarin at Everest College in Luwero district, Uganda. The decision was driven by ties between the countries, says Grace Baguma, director of the national Curriculum Development Center. Kinene Charles, one of the students learning Mandarin at Everest College in Luwero district, thinks the language will open up job opportunities. “I am interested in learning Chinese because it can help me to be employed in Chinese companies. And if I have a friend who knows Chinese, he can get a job and invite me to act as an interpreter in Chinese anniversaries,” he said. 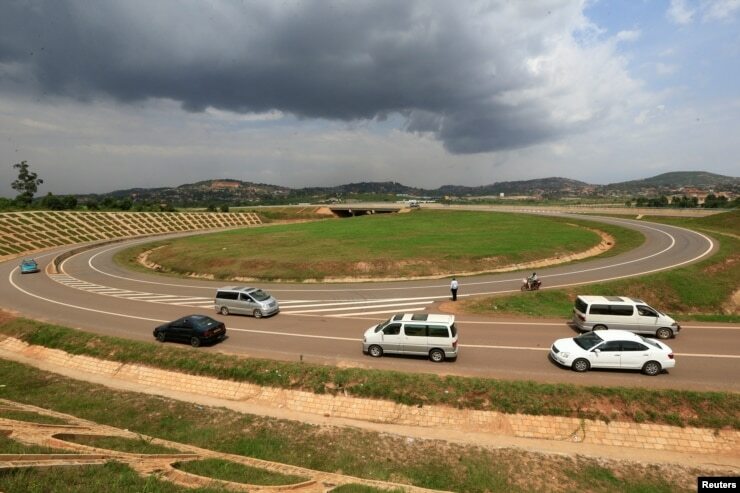 FILE - Vehicles drive on the interchange of the new Chinese-built 51-kilometer (31-mile) four-lane expressway connecting Uganda’s capital Kampala to Entebbe International Airport, in Kampala, Uganda, Jan. 29, 2018. For the last four years, the Confucius Institute at Makerere University has been instructing students in Chinese. The students are now being assigned to different schools in the country to teach the language. Namisi Moses Apollo says that he was a poor student in his regular schooling, and he worried about finding employment. But he says learning Chinese was easy, and upon graduation he was asked to start teaching in a pilot class in Luwero. 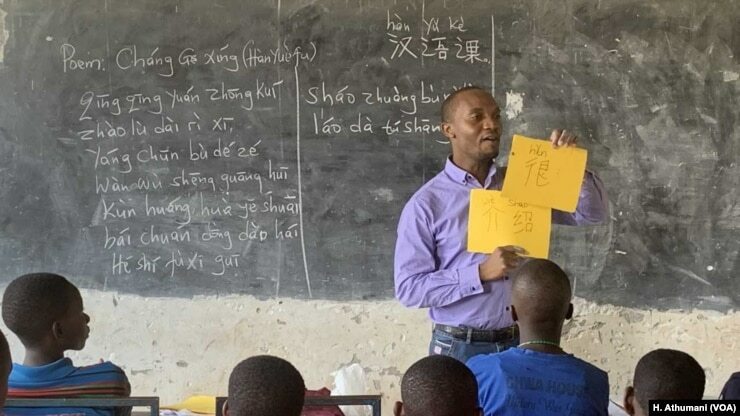 According to Namisi, there are vast opportunities in Uganda for people who can teach Chinese, though he notes that in most cases, it’s the Chinese government paying the salaries, and one has to be very professional. Visiting Chinese officials have over the years emphasized what they call the template of Africa-China cooperation. FILE - Ugandan President Yoweri Kaguta Museveni, left, shakes hands with Chinese President Xi Jinping during a signing ceremony in the Great Hall of the People in Beijing, March 31, 2015. 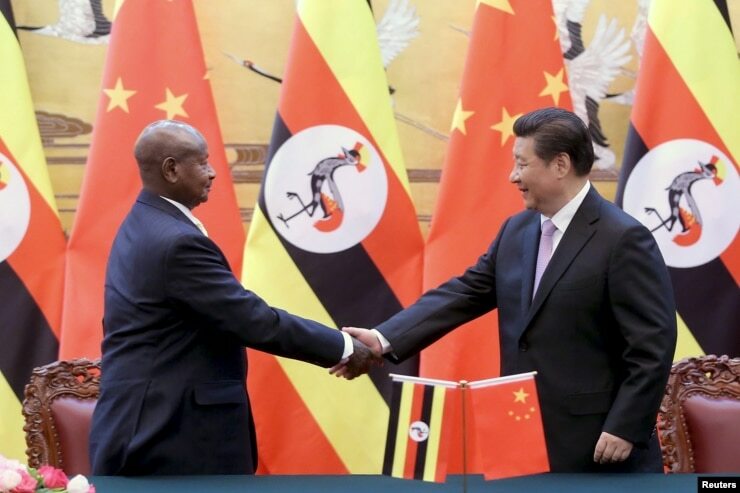 China has funded many large infrastructure projects in Uganda, including the 600-megawatt Karuma Hydro Power Project, with a price tag of $1.8 billion, and a highway between Kampala and Entebbe, which cost $350 million.